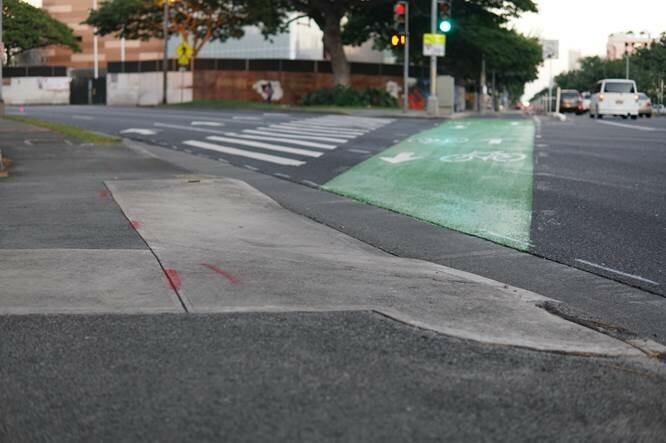 A curb ramp at the intersection of Alapa‘i and S. King streets. Honolulu – Under a recent agreement between plaintiffs Jim McConnell and Mark Edwards and the City and County of Honolulu, the parties have agreed to close out the 1997 federal consent decree that addressed street and sidewalk accessibility under the Americans with Disabilities Act, or ADA, which was passed by the U.S. Congress in 1990. Under the consent decree, Federal Magistrate Judge Kevin Chang was appointed to assume control of the matter, the late Paul Sheriff was appointed as the court monitor, and Bill Hecker was retained as the city’s consultant to provide advice as a recognized expert in ADA compliance and accessibility standards.